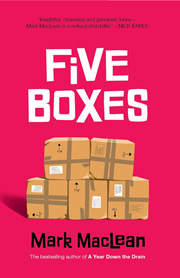 Wonderful news, with the UK edition of Five Boxes not only making it onto the shortlist of the Lakeland Book of the Year awards, but actually winning the Zeffirellis category! Unfortunately, I couldn't make to the ceremony – at the luxurious Armithwaite Hall – it but my daughter, Isobel, was there to accept the award on my behalf. The lucky thing also got to meet the legendary Hunter Davies. See the Five Boxes page for more news, reviews and details. Find out more about Five Boxes, A Year Down the Drain, The Oldest Man in the Universe Goes to Groovin' the Moo, The New Landscape or A Short History of Ireleth & Askam-in-Furness. See also author profiles on Amazon UK (.co.uk) and Amazon USA (.com) and the book-by-book listing on Amazon Australia (.com.au).